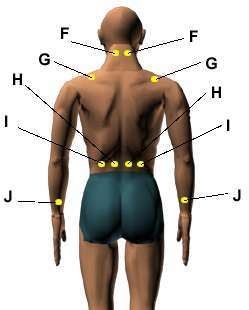 There are the acupressure points for relieving Chronic Fatigue Syndrome. Working on these points can help you get better quicker. You do not have to use all of these points. Using just one or two of them whenever you have a free hand can be effective. Location: Directly between the eyebrows, in the indentation where the bridge of the nose joins the forehead. Benefits: Aids chronic fatigue syndrome complaints, especially irritability, confusion, and headaches. Location: On the outer part of the chest, four finger widths up from the armpit crease and one finger width inward. Benefits: Relieves difficult breathing, fatigue, confusion, chest tension and congestion, emotional repression, coughing, and asthma. Location: Three finger widths below the belly button. Benefits: Relieves general weakness, extreme fatigue, dizziness, and confusion that results from the chronic fatigue syndrome. Location: Four finger widths below the kneecap, one finger width on the outside of the shinbone. If you are on the correct spot, a muscle should flex as you move your foot up and down. Benefits: Relieves fatigue, dizziness, and general weakness, as well as strengthens and tones the muscles throughout the body. Location: On the top of the foot, in the valley between the big toe and the second toe. Benefits: Relieves fainting, dizziness, fatigue, confusion, headaches, nausea, and irritability. Location: Just below the base of the skull, in the hollow between the two large neck muscles, two to three inches apart depending on the size of the head. Benefits: Relieves headaches, arthritis, insomnia, dizziness, stiff neck, neck pain, injuries, trauma, shock, hypertension, neuromotor coordination, eyestrain, and irritability. Caution: Pregnant women should press this point lightly. Location: On the highest point of the shoulder muscle, one to two inches from the side of the lower neck. Benefits: Anxiety, irritability, fatigue, shoulder tension, poor circulation, cold hands or feet, nervous problems, and headaches. Caution: Do not press on disintegrating discs or on fractured or broken bones. If you have a weak back, a few minutes of stationary, light touch instead of deep pressure can be very healing. See your doctor first if you have any questions or need medical advice. 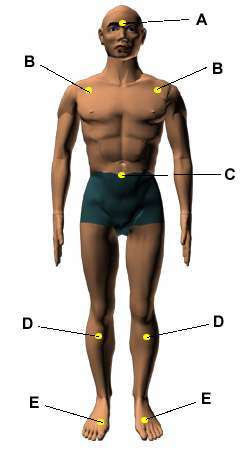 Location: In the lower back two ( Points H ) and four ( Points I ) finger widths away from the spine at waist level. Benefits: Relieves many chronic fatigue syndrome symptoms such as muscle weakness, extreme fatigue, irritability, dizziness, and confusion. Location: Two and one-half finger widths above the outer wrist crease, between the two forearm bones. Benefits: Relieves rheumatism, wrist pain, and shoulder pain and increases resistance to colds and flu. Location: Two and one-half finger widths up the arm from the center of the inner wrist crease, midway between the two forearm bones. Benefits: Relieves indigestion, nausea, insomnia, nervousness, palpitations, and wrist pain.